After decades of decline, the number of deaths in traffic accidents across the US has risen for yet another year. A recent report from the National Highway Traffic Safety Administration (NHTSA) states that speed and alcohol remain substantial causes of accidents. Other safety experts assert that the true cause of the rise in fatalities on the road is distractions posed by phone use. Read on to learn more about this serious issue. The NHTSA publishes a report each year that includes the total number of fatalities on the road, including a breakdown between different types of roadway occupants—passenger vehicle occupants, large truck occupants, pedestrians, cyclists, etc—and the perceived causes of the fatal accidents. In 2016, the NHTSA reports that 37,461 people died while in or near a vehicle. This total represents a 5.6% rise in roadway fatalities as compared to the total in 2015. Based on this total, states the NHTSA, an average of 100 people were killed each day of 2016 by a motor vehicle. Between 2014 and 2016, there has been a 14.4% rise in the annual number of traffic fatalities. While the number of total vehicle miles has also risen during this time, it has not kept pace with the number of people killed, meaning that other causes for the fatality rate must be involved. Deaths among non-vehicle occupants are climbing at an even faster rate than those among vehicle occupants. This group includes pedestrians, cyclists, and motorcyclists. For example, a total of 5,987 pedestrians died on the road in 2016. This is an increase of over 1,000 deaths from 2014’s total number of pedestrian deaths, which is a rise of 22% in just two years. Cyclist and motorcyclist fatality rates have also risen about 15% each during that time. The NHTSA states in its report that only 9.2% of all fatalities were caused by distracted driving, and that only 448 deaths can be attributed to distractions caused by mobile phones. The NHTSA bases these figures off data received from state law enforcement agencies, rather than its own investigations. Many safety groups believe that these numbers are skewed. 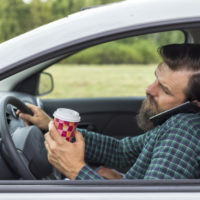 These groups point to the fact that studies have shown that phones are activated during about 88% of all drives, and that the types of deaths that are growing—harder-to-see non-vehicle occupants, for example—are more likely to result from a driver only glancing up at the road from their phone occasionally. Drivers who recklessly text or email while behind the wheel and cause injury accidents may be subject to serious financial penalties through an Idaho personal injury lawsuit. If you’ve been injured in a crash in Idaho, find out if you have a right to money damages for your injuries by contacting the skilled and knowledgeable Idaho personal injury attorneys at Pedersen & Whitehead for a consultation on your case, in Boise at 208-336-2552, with additional offices in Twin Falls at 208-734-2552.